Keep it elegant and classy with this gorgeous long Romance Dress. 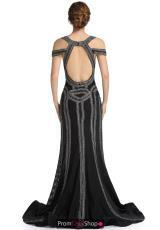 Style Rm6103 showcases a v-cut neckline featuring off the shoulder straps adding an edgy look. The unique patterns naturally cinch your waistline while the fit and flare silhouette is comfy and completed with an exclusive open back followed by dramatic flaring train.